When I was in the university I travel almost fortnightly from my school (U.P. Baguio) to home (Quezon City), in that 250 km drive or bus ride there will be several stops in major provincial towns and at every busy intersection you will be swarmed with street hawkers selling their local specialty. This is not just common in that route but in almost every main roads in the Philippines, a common scene that I miss as every journey will never be complete without trying out those specialties offered. Some of the popular ones are Buko Pie in Laguna / Tagaytay, Roasted Cashews in Antipolo, Chicharon in Bulacan and this post the Tupig from Pangasinan. 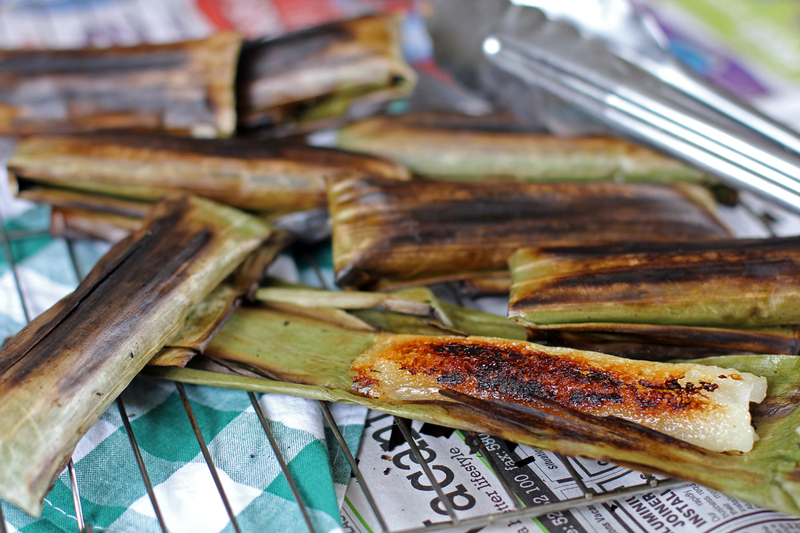 Intemtem or Tupig is a popular native delicacy from Pangasinan which is made out of ground glutinous rice and coconuts strips wrapped in banana leaves then cooked over charcoal. During the old days this rice cake was served only during Christmas and New Year, it was also believed that it was given commonly to carollers during Christmas (Like sweet treats given on trick or treats in the West). Then in the 1960’s it started to become commercially popular and the rest was history. Now you see them everywhere from the streets to the fresh markets and specialty shops, new types of flavours have been created like jackfruit, pandan, strawberry, purple yam (ube) and guava to name some. I guess this would not excite a lot of people but for Filipinos this will be something special, especially for those overseas and haven’t tried this for a long time. I remember I posted a photo of this on Facebook the first time I made them and in an hour it got 100+ likes. It may look not that appealing to you but if you haven’t tried tupig yet I suggest you do so, this sweet rice cake concoction is so addictive. The chewy sweet centre with bits of fresh young coconut strips and the crunchy charred bits will definitely make you ask for more. In a small mixing bowl add glutinous rice and pour enough water to soak the rice. Leave it in a room temperature overnight. Drain the water from the rice then place in a cheesecloth to remove excess liquid. Place in a blender or food processor and process until it becomes a powder, add the coconut milk and sugar and continue to blend until even in consistency. Place mixture in a bowl then combine with the coconut strips. Place 2 tablespoons of mixture in the centre of the banana leaf then wrap by rolling and fold the edges to avoid dripping. (This will be tricky as the dough is very runny, it takes practice). Immediately place in a charcoal or any grill once you wrap one, cook by turning frequently. Once the banana leaf is charred on all sides remove it from the grill then set aside to cool before serving. Oh I’d love to try this, thanks. Not heard of it before. I love this stuff! I still have a few pieces in the freezer, my in-laws’ “pasalubong” from their most recent visit to the Philippines. This is a new dish to me, and sounds quite interesting. I really love dishes that evoke memories, so thanks for sharing those with us. Good stuff – thanks. My grandmother used to make something similar but it was not a dessert and not as sweet. She would put tender cooked chicken with turmeric, onions, and garlic in the center and roll it in banana leaves or foil. It was so delicious! Oh, for a Tupig hawker nearby… Sounds delicious. Never have heard of Tupig but after seeing this post, it’s definitely something I would love the try! Looks like a very tasty treat! So as you can tell I’m way behind on my commenting – and you are killing me! You’re featuring too many things I want to make. I haven’t had tupig in forever, it’s so delicious. What are young coconut strips? It is just fresh young coconut meat? I’m trying to think of what I could get in the US. Missing tupig. Have not tasted it for a long, long while. My grandma is the best in making kakanin. Tupig is 1 of her best. Pero di namin nilalagyan ng coconut cream ang tupig.Ung sugar, half brown and half white ang ginagamit namin. Tapos ung coconut strips, ung di manipis at di din matigas. kung baka, sakto lang sa tanda ung buko. Sticky sweet rices and coconut are a thing of love. Tasty, sweet and delicate. I can’t eat sticky rice in a savoury form, but when it’s sweet and scented with beautiful leaves like this, watch out!!! 😉 looks delish. I tried tupig from Vigan, which are cooked inside bamboo shoots, and I loved them too. Well, your picture above reminds me of another favorite: fried eggplant (pritong talong)! Thank you for your post. I, too, treasure and crave our Filipino kakanin, or kangkanen in Ilocano. I was born in Pangasinan and watched both my late mother and grandmother make tupig over a flattened corrugated iron that was placed right on top of the stove. I have recreated two recipes of tupig but I prefer calling tupig as Coconut Sticky Rice Bars rather than logs. Linguistically, tupig has the same root word as dippig or flat. My Mamang and Bae (grandmother) spent all of All Saints Day making Baduya (fritters),Linapet (steamed sticky rice–not flour– logs), tupig, tinubong (almost the same dough or batter as in tupig but placed in bamooo tubes (tubong) which were then burried in embers to cook). I bake my tupig, lining the bars with the folded side on the bottom on an 18 x 13 cookie sheet. I do not fold the ends which allows the dough to expand while baking. Cheers! You have a great recipe for tupig here and some fantastic comments which are very helpful. I was thinking of making it again. Tried it by myself on the blog and can only do it while we have good outdoor weather here in the east coast. I miss tupig so much. Thanks for the inspiration and recipe, Raymund. Must try yours. Ang sarap! Can you steam it? Vise putting it on the grill? I guess you can (never tried it) but it defeats the purpose of ‘tupig’ as it gets some of its flavour from the burnt banana leaf as well as its smoke. Now that it’s grilling season here in the US, I’ve been wanting to make this. But I’ve never seen anyone do this before. I’ve only eaten them. Can you tell me the details for grilling? Do I put them directly over charcoal? How do you keep the banana leaves from catching on fire? Thanks in advance. Not directly but above it roughly 3 inch over a mesh grill. Banana leaf will burn so turn it occasionally so it does not totally catch a fire. Ok. Sounds good. Thanks so much for the quick reply. Will let you know how it turns out. Can i broil it in an oven? I haven’t tried it so I would not suggest it. It need a fast cooking heat like charcoal so it solidifies the inside quickly and not seep ou the banana leaf. Charcoal also gives a distinct flavour. I think the next best method is to grill it in a gas barbecue. Can i bake it in the oven? Thanks for the recipe! I will want to make this for my Coffee Party come December 30th! And just like you, I’ve had the same college days experience with street hawkers selling tasty treats whenever I travelled home from Baguio to Ifugao! Tupig was (and still is) a favorite. I’ve always wanted to learn how to make it since it costs so much for a student’s allowance back then.